Cultivate Tea & Spice Co. is a St. Augustine, Florida based and family owned company. We source the best quality, certified organic ingredients for all of our loose leaf tea and culinary spice blends. Our products are hand-blended by passionate artisans and in small batches to ensure the best quality every time. You can find our products at fine stores and markets in the area; and our teas are freshly brewed and served in some of your favorite coffee shops throughout Northeast Florida. We also love meeting our customers at the St. Augustine Amphitheater Old City Farmers Market every Saturday from 8:30 - 12:30. Come on out and sample some of our tea varieties! When you buy from Cultivate Tea & Spice, you can be sure you are getting a premium product at a great price that was hand-crafted locally and with love! 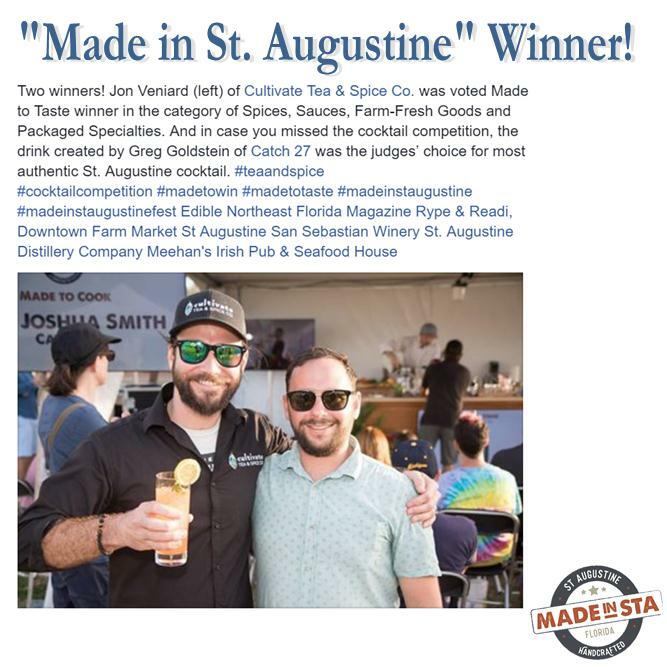 Made in St. Augustine 2018 - Cultivate Tea & Spice Co. was voted "Made to Taste" winner in the category of Spices, Sauces, Farm-Fresh Goods and Packaged Specialties.